EMC² Interiors is a full service, residential interior design firm creating innovative, functional, and customized living spaces. Located in Park Slope, Brooklyn, we have worked with clients throughout the US, and abroad. The firm is fully outfitted to handle jobs large or small, from one room to renovating and decorating an entire home. Principal Designer, Erin Coren, CID, ASID, holds a Bachelor of Science in Interior Design, is a New York State Certified Interior Designer, Professional member of ASID, (American Society of Interior Design), a NCIDQ certificate holder (National Council of Interior Design Qualifications), and is constantly educating herself on new sustainable approaches that can better the health of a home, as well as the environment. As a project manager and designer, Erin has worked on various notable projects for corporate CEO's, magazine editors, television shows, celebrity homes and organizations such as Starwood Hotels and The Trump Organization. 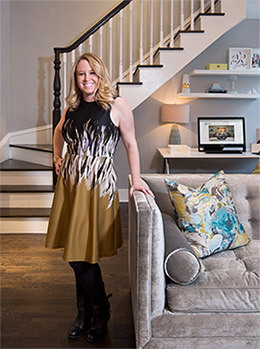 She has recently worked on HGTV's design show, "The Unsellables," as well as published in Working Mother Magazine on Nursery Design and how to enhance sleep patterns for infants using design techniques.